I love Halloween! I loved it as a kid growing up and I love it as an adult and teacher. You can ask any of my former students and they will be able to tell you what we did on Halloween in 5th grade. I have been reading the same ghost stories for 15 years now and they still have the same affect on kids today that they did in the past. 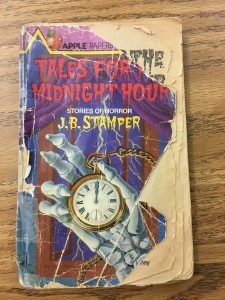 The stories are from the book Tales for the Midnight Hour by J.B Stamper. I read them when I was a kid and I still have the same book. It is a bit worn and tattered, but I think that adds to the scary stories. Each story is written in a suspenseful way that keeps you on the edge of your seat. I also add a little emphasis at the end of each story to really get the students hearts racing. I only read 2-3 stories a year, but the students remember them forever and keep asking for more. This year was no different. I am sure there will be some blog posts written about today’s events. Happy Halloween! Those scary stories were very scary. I couldn’t sleep for a while that night because the stories were so scary! When I finally fell asleep I woke up in the morning crying. It is fun to read about your love of Halloween. My students love Halloween. My own kids love Halloween. Most of the adults I know love Halloween. My dog even loves Halloween (he was a “rufferee” with black and white stripes and a yellow flag as if he was an NFL ref). And the beauty of the situation is, I dislike Halloween. It is a day I don’t understand, it’s a day I want to avoid, and it’s a day I’d like to have go away. Any other day we call the police about an adult in a mask. Any other day we raise our eyebrows at someone in a costume. Any other day we warn kids not to take candy from a stranger. And just because everyone is doing it it’s all of a sudden okay? Even the candy, which I do love, is suspect on Halloween, not just because it’s given out by creepy people in costumes. It seems as if when I eat it I feel sick to my stomach three times as fast as usual. Just looking at the overflowing bowl of candy in our foyer makes me feel sick. I’m repulsed by it, and it gets to the point where I don’t want anything to do with it. What? Repulsed by candy? That’s what Halloween does, and I think it’s wrong. And in some ways, you are a part of this. While you may be all for Halloween, do you really want to be anti-candy? At the same time, I do love a good scary story. I’m going to order that book soon if I can find it. I respect your views on Halloween and I agree with you with regards to the candy. I could do without the candy aspect of it, especially after learning how a lot of this candy is produced and made using child labor. However, I do enjoy the other parts associated with Halloween. I love the “spookiness” of the holiday and all the scary stories and eerie music that go along with it. I think that is my favorite part. I do enjoy dressing up and I enjoy seeing the excitement in my kids as well. This year my 3 year old son and I both dressed up as the Incredible Hulk, or “Hulk Smash” as he is known to kids these days. I never heard of a Grinch of Halloween, but maybe you can start a new trend. I am sure you are not the only one who feels this way towards this day. I’m glad you still go along with the festivities to a degree and love how you supported your reasons for disliking Halloween with detailed examples. IF you can find the book, get it! Your students will love it!